During the Day 1 Livestream of the Star Wars Celebration 2019, head of Respawn Vince Zampella revealed the highly anticipated Star Wars Jedi: Fallen Order will be a single-player, story-driven game with no multiplayer or microtransactions in sight. Order 66 took place after the Clone Wars and, as you might remember, Emperor Palpatine calls for the order to be executed during the Revenge of the Sith. The secret order recognises all Jedi as traitors to the Galactic republic, and allowed the Grand Army of the Republic to execute any Jedi who cross their path. It’s easy to see why this time period is referred to as the ‘Dark Times’. After the story tease, Zampella officially revealed the poster for the Fallen Order, which you might have seen already thanks to Amazon accidentally leaking the image on a t-shirt just days before the Celebration event. You can see Zampella’s short talk about the game below at around the 5:04 mark. A panel all about the Fallen Order is set to start today (April 13) at 1:30 PM CT/ 7:30 PM BST, with Vince Zampella and game director Stig Asmussen who will also be joined by a host of other guests. 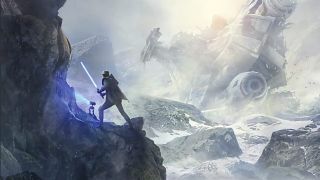 Star Wars Jedi: Fallen Order was first revealed at E3 last year, and since then we’ve only gotten little tidbits of information about the hotly anticipated game set in the Star Wars ‘verse. It truly feels like an honest to goodness narrative-driven Star Wars game is what we need right now. And after all of the microtransaction upset EA caused for Star Wars Battlefront 2 back in 2017, seeing Respawn take the Fallen Order in this direction is very welcome. Excited about the Fallen Order? So are we! Be sure check out our round-up of the Fallen Order: release date, new lightsaber teaser, and potential story.